JMP developer Craige Hales created the very cool graphic you see here. It's a cardioid, which Wikipedia tells us is a shape made by rolling one circle around a stationary circle and tracing one point on the perimeter of the rolling circle. Its name comes from the Greek word for heart, and it has a heart-like shape. So it's perfect for Valentine's Day! 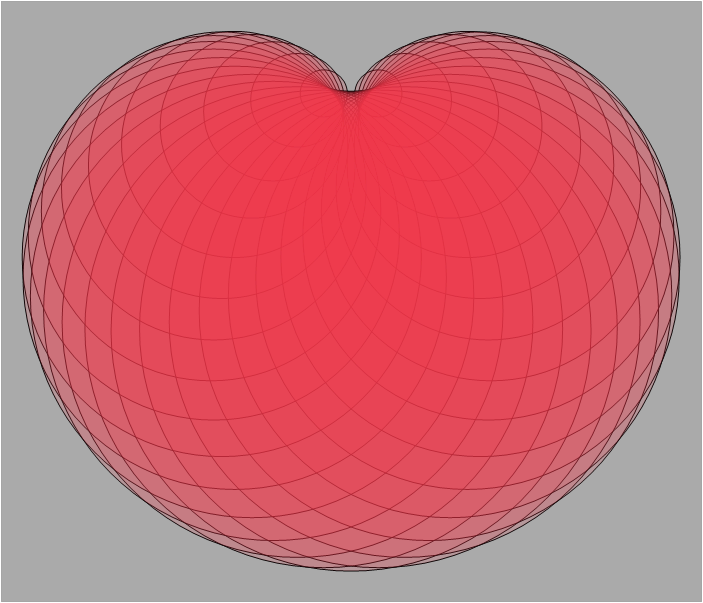 Craige's cardioid is interactive in JMP, and he has shared the JSL (JMP Scripting Language) file for it in the JMP User Community. When you run the script, you see the cardioid and two buttons, "Less" and "More." Play around with those buttons to see interesting variations. While you are in the Community, be sure to check out Craige's excellent blog titled "Uncharted." In a recent post, he notes that Valentine's Day this year coincides with Doomsday :) In another post, he explains a set of functions for working with strings in JSL.